During a blustery winter night, two retired Navy Seals transporting a top secret cargo to NORAD are besieged by an unexpected blizzard. A terrible car accident unleashes a creature with unparalleled killing capacity. Within hours dozens of people are carved up and dismembered in the town of Mangas Pass, Colorado with no end in sight to the carnage. Police Chief, Don Girard pairs up with retired Green Beret Colonel, Elliot Harmon to try to stop the creature from decimating the entire town. Harmon will be forced to face the sins of his past, while Girard helplessly agonizes over every death in an effort to protect the town and his own family. 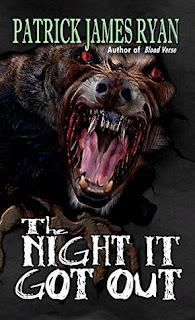 As the bloody body count rises, both men become consumed by a horrifying sequence of events that will forever change their lives The Night It Got Out! From the author of the popular short story collection, Blood Verse, comes a horrifying novel of suspense and terror that you won't be able to put down! Fans of Guy N Smith rejoice as Patrick James Ryan's 'THE NIGHT IT GOT OUT' has the feel of the formers work and a B- movie. If you like your characters too not have much to them then that is what you get here, other then the main characters the rest just seem like your typical monster feed in a horror film. This is not a bad thing at all as this propels you through the book without having to read everybodys back story, after all this is a horror novel not a Hallmark special! Positives for this book are that you can imagine the scenes pretty well especially the gore and the way the monster looks, though my imagination seen it more man beast like then the cover has you thinking it is. Negatives, well not many other then the fact you dont particularly care much for the Colonel or the Police chief but they do their job and lead you through the book. At 220 pages this novel does not outstay its welcome, I thoroughly enjoyed reading this book and would recommend that anyone that is a fan of monster mayhem check this novel out.